It’s a bit cool on this Sunday morning in May. The sky is gray and the weather forecast is gloomy. But the mood is bright in two Lancaster County homes. Courtney checks herself in the mirror before heading off to church with her family. Prom is over, and it was so much fun. Graduation is right around the corner! She smiles to her reflection, adoring her bright white teeth. They’re perfect! Mom pokes her head into Courtney’s bedroom. Wendy’s so proud of Courtney. She’ll be graduating soon, and thankfully staying close; going to Elizabethtown College in the fall. It’s gonna be a busy summer with graduation and the celebrations that go with it. Teenage girls are expensive at this age, with prom dresses and shoes and senior week. But it’s well worth it. She’s ready for the next stage of her life now. All of the dental stuff is done now for Courtney. A year of Invisalign capped off with teeth whitening that had a little bonus. Along the way, Courtney even found a rewarding volunteer activity that’s good for her soul. A few miles away in Lancaster, a young family rushes into the house from early Mass. “Okay, okay! Go get changed and clean your bedroom. Both of you.” Maria can’t help but smile. Life is so much better this Springtime. It feels like her family is getting closer. Like she’s a better mom and wife. Married life isn’t so filled with worry. Her and William seem to have grown closer as they spend time planning their life instead of being swept up by it. 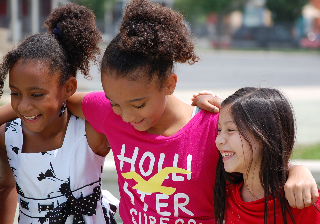 It’s made the kids happier too, and they’re doing better in school. As William opens the fridge to help with breakfast, she stops him and takes a long hug. There’s a connection between the two families, even though they don’t know each other. Life is a little brighter for Courtney and Wendy, and that benefited Maria and her family. Why is this story on the website of White Family Dental? Because Wendy took Courtney to get her teeth whitened during the Smiles for Life campaign at White Family Dental. They were both greeted by name and had a laugh with Nancy at the front desk. Wendy decided at the last minute to have her teeth whitened, too. Every penny of the small investment in Courtney’s pride and Wendy’s smile went directly to the Power Packs Project and those funds were invested in Maria and her family. It was more than a donation of food for kids in need. It was an investment in education for Maria and William. Not only do they receive wholesome ingredients to feed their family over the weekend; they’re taught how to start and keep a budget for the family, how to properly prepare and store wholesome meals. How to work together as a family for a better life. That’s the mission of the Power Packs Project. 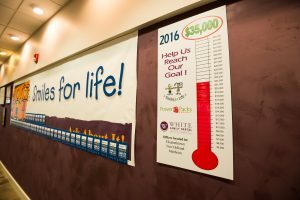 That’s the goal of the Smiles for Life Campaign at White Family Dental. That’s a glimpse of what can happen for your family and another simply by scheduling a Teeth Whitening procedure between now and the end of June at any one of the locations of White Family Dental. All proceeds from the procedure go to help hungry children in need of wholesome meals. Teeth Whitening is a small investment in your family that benefits another. Improve your smile, and you’ll generate many more. Even some that you may never see. Been going here for years. Very friendly staff and really care for patients. I had a great experience until I told my dentist that I have a chronic pain condition and that I take pain pills. I'd had several serious issues with my teeth and read research showing a link between my condition and tooth decay. I went there one more time for, I think, the third root canal I'd had in just a month or two. It took two hours and typically they try not to do more than an hour at a time. At the end, he told me he wouldn't be giving me pain meds. Every other time, they had. When he stepped out of the room, the dental assistant looked at me horrified and told me that I needed to tell him to give me some and she was completely shocked that he wasn't going to give me any after a two hour root canal. But he refused and said call if I really need them. I was talking Tramadol for my Endometriosis, but it is not strong enough to deal with tooth pain. At that time, it had been nearly two years since I'd actually gone out to have fun as I'd been bedridden from my pain. It just so happened the day after my procedure, my husband and I had bought comedy show tickets and I desperately wanted to go. So I called and asked for a few pain pills because my tooth really started hurting the next morning. They agreed. However, when I picked them up, the receptionist informed me that, "this is not a pharmacy" and they will no longer give me pain meds regardless of what procedure they perform. I was mortified as the whole waiting room listened... I just walked out and cried in my car. I'd never experienced that level of discrimination before. A few days later I got a phone call from them. Suddenly, my pre-arranged monthly payments were no longer sufficient and I had to pay my balance in full before I could return. I'd just had Step 1 of the 2 Step crown procedure and asked if I could please just come in for that last appointment since I had just paid to do the first part. Nope, the second step wasn't immediately necessary so I could wait until my balance was paid. I know this is a long review, but I'm hoping others who struggle with chronic pain will read this and know to go elsewhere. Hopefully others will feel the same way too. Discrimination of any type is not acceptable, especially in the medical /dental community. I was taking Tramadol, which is a step or two above Aleve- not near strong enough to help with tooth pain. I wish they would have gotten to know me first. They would likely be surprised to know I have my Masters in psychology, refused pain meds for the first three years of my chronic pain, and only wanted 5 pills max, just enough for a day or two and so I could go on a date with my husband for the first time in two years. Also, I really don't think anyone would pay for and go through a root canal for five vicodin or percocet. I've actually worked with addicts before I got ill and to be honest, feigning a need for a root canal would be counterproductive to the addict's need for the "no feeling" high. I'm so disappointed in them, as a person, patient, and therapist. *I'm pretty sure Dr. White told the billing lady to call me and tell me that my payments were no longer acceptable. I believe he has been fully aware of what happened. I am not contacting "you". This review was provided to help other people with illnesses or disabilities make an informed decision. No one with an incurable disease should have to face such immature and unethical behavior when seeking care. No record? Wow... I didn't think you guys would stoop so low as to blatantly lie. And I'm pretty sure I'm not going to confuse the only dentist I've been to since I've lived in the state of PA.
Nice, people, Dr White very nice dr. I received A call, saying after he n another dr discussed, I was not a GOOD fit! To get a tooth pulled? No explanation, except, my health history. I was not encouraged, to say the least. People, it is your decision, whether or not to Pull ur tooth. Sometimes it does come down to money, $3,000 may glibly fly from some folk's repertoire, but for us not able to get able dental insurance, with our health plans, Its a tossup. D.W. Smiles n happy, peppy people, yes by all means , DO contribute to a positive dental experience! I couldn't agree more. :) Honestly, folks, I so wish those lovely qualities could translate into cash. But reality, being What it is, prevented my first plan , to save my tooth, then crown it. I just could not bear to see my retired husband have to work so hard, to pay for it. With a broken knee, I also have Post Concussive Syndrome, he takes care of me so well.The rest I still have no knowledge of . Things are not always what they seem. :) As matters turned out, he had been fed the Wrong conclusion, by the first dentist's Assistant. I straightened it out with the correct facts. We are ,^^^"friends" again. D.W. They have the most amazing and patient people working at the office. The work with any fear or worry you have. I will never go any where else... they are wonderful! Thank ya'll SO much!!!! The White Family team is amazing! Not only are they at the top of their field, they also treat you like part of their family. Their attention to detail is like no other, and they genuinely care about their clients. I always leave with a smile on my face after my visits.